Preparing for the next season is something I enjoy. I like to think of how blessed we are, that we can enjoy 4 seasons in one year. Each one of them is so beautiful in their own way. Such variety, such beauty, and the sights and smells are so unique in their own time. Right now I'd like to just briefly share how I like to prepare for winter before it gets here. for all her household are clothed with scarlet." First of all, it's important to prepare myself, because so much of life is a matter of mind set. I need to think of ways to make beautiful memories during the cold and cloudy season of winter. Not that it's always that way, because there are also beautiful sunny days where the ice and snow make such neat patterns on the windows. The trees are so laden with ice. If we just take time to look around, winter is beautiful. I need to have that mind set. To prepare projects, or events to do in the winter that I don't do in the summer is another reason to look forward to winter. To prepare to do a Bible Study with a few friends is also so rewarding. Secondly I like to prepare to have extra food and water on had in case of a hydro interruption. Food like beans, potatoes, rice, pasta, canned foods like, soups, sauces. It feels good to know that if there's a snow storm, or a power outage we're not at the end of our resources. Lamps, candles, and lighters are important to have. These are just a few things, but feel free to comment and share what you do to prepare. I also like to purchase a few medical supplies to help with the flu and cold. There are so many things we can do for ourselves to leave the hospital waiting room for those who really need it. To put our family on vitamins for winter is important. My favorite smells for winter are apple cinnamon, and orange. Ahhh! My daughters and I go to Sparta Candles every fall to purchase candles that have come to remind us of winter. It's become a tradition that we look forward to. Share comments on things that you do to prepare for winter, or maybe this has prompted you to look around for ideas. Share them with us. Please sign your name in the comments so we know who is sharing! Thank you for sharing Teana, I have been thinking a lot about starting some sort of tradition to do each winter/Christmas and this has motivated me to search deeper and ask God for direction in what would be best for our family. I've also been reminded that I need to get some food made in case of Hydro outages. 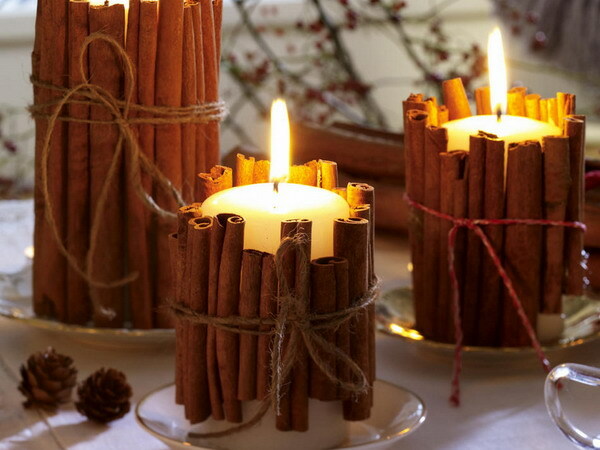 I can just about smell the cinnamon candles in the picture! Good choice. Thank you for the practical tips. I need to check on some basic winter needs like growing childrens' outer wear. One thing I don't enjoy about the cold seasons is wiping condensation from windows to keep them from getting moldy. Does anyone else have that problem? I love your tradition of purchasing fall candles. I'm really excited about getting out sweaters, cozy socks and scarves :-) but more than that I'm super excited about cooking soup in the winter. Restaurant soup, butta soup, sommerborscht, noodle soup, sauerkraut soup etc. I make soup all year round but there just something comforting about having hot soup when the cold winds are blowing outside. Quite honestly it has never dawned on me to prepare food incase a power outage. Great idea! cozy sweaters out of storage and washed up. Great food for thought Teana! Love reading all these ideas! Thanks for the reminder on getting food and other things ready for power outages in the winter! At this time of year I like to get out all my scrapbooking things and catch up on all the summer events! With 4 children it's a little hard to keep up with it thu the year, but when the snow is blowing outside, its just a great time to make more memories with pictuers, putting them in an albem with some words of there age or time when it was taken helps so much in the future! Those are some great ideas! Although it's in the middle of winter I'm exited to start doing some of those things, specially candles & soup, our family loves soup.